Alcohol remains to be one of the oldest drugs still being used today. Many people have enjoyed its many incarnations after the discovery of fermentation, but the alcohol side effects on the body have been experienced to some degree by many. 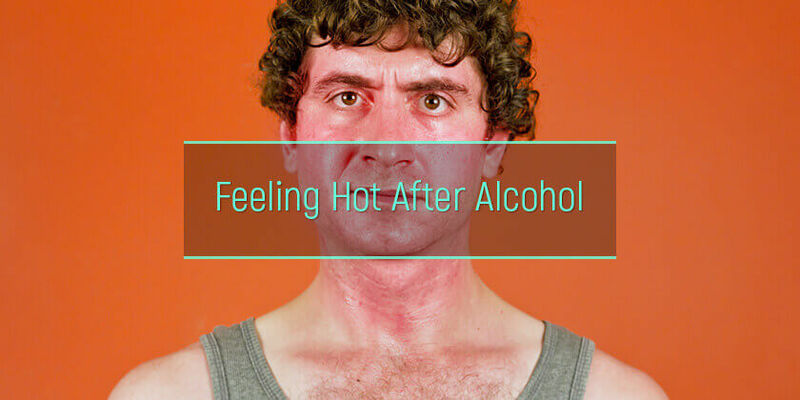 Sweating after drinking alcohol along with increased body temperature, facial flushing, and hot flashes are common but less noticeable as compared to other more serious and popular adverse effects like loss of motor control and slurred speech or associations like gout and alcohol consumption. These temperature and superficial skin changes may look like nothing more than discomforts that will go away easily, but they are outward manifestations of the changes spirits does in the body. How does alcohol make you feel warm? Why does alcohol make you sweat? Can alcohol warm a person up? Does alcohol cause hot flashes? Why does face flush after alcohol intake? Why Does Alcohol Make You Feel Warm? Alcohol can change different reactions in the body, including skin and core body temperature. Drinking spirits can make one feel warmer while increasing his or her risk of suffering from cold. The main mechanism as to how does alcohol raise body temperature involves different organs like the heart, brain, and liver, which are the main sources of body heat. It can also be tied to the vasodilator effect of alcohol. It causes the blood vessels in the skin to dilate, shunting blood from the center to the peripheries. The body temperature is not actually changing; there is just redistribution of heat as seen flushing and fever after drinking. Human’s normal body temperature is approximately 37 degrees Celsius or 98 degrees Fahrenheit. Most of this heat comes from metabolism. The skin has sensory receptors that can adapt to temperature changes. If they feel warm, they’ll send signals to the brain. While this may look like an advantage, it can actually be dangerous. Alcohol disrupts the body’s natural ability to detect warm and cold. And since after drinking, people are feeling warm, most would forget about their coats, a phenomenon known as alcohol cloak, because they feel too warm for their outer garments. Sweating will soon start, which will further decrease body temperature and there’s a risk for hypothermia. Digestion, especially via the liver, can also alter body temperature. When the liver metabolizes high levels of spirits because it gives off a lot of heat, leading to warm body temperature. As mentioned earlier, alcohol affects the central nervous system, the circulation, and virtually all parts of the body. One of the more common side effects of drinking spirits is sweating after drinking. The body does sweat to lower its temperature through evaporation. The liver can effectively metabolize around one serving of alcohol in an hour, so consuming more can increase the blood alcohol content faster, and one will start feeling intoxicated. Toxins caused by the liver’s slow ability to metabolize liquor will build up in the body, causing changes to the way the brain and organs work. Alcohol toxins can cause enlargement of the blood vessels in the skin. This dilation is common because of the changes in body temperature as discussed earlier. Others may think that sweating after drinking spirits is good to flush it out of the system. But this isn’t true. Alcohol lowers the body temperature, and sweating can decrease it further. Also, according to Bowling Green State University, only 10% of the alcohol people drink leaves the body via the urine, breath, and perspiration. The rest is consumed and broken down into byproducts. Perspiration will not release alcohol from the system any faster. People have always known the association between essential tremors and alcohol because of the involvement of the brain in alcohol intoxication. But little do they know that the hypothalamus is likewise very much affected – a brain part that is responsible for keeping the body at a comfortable temperature. In one study, researchers found that aside from skin vasodilatation, alcohol can alter the body’s ability to regulate temperature. If this happens on warmer days, drinkers may feel dizzy or nauseated. But, on cold nights, especially during winter, drinking excessive amounts of alcohol can be very dangerous. If the environment is cold, drinkers are more likely to get colder. Hot flashes are very famous as a symptom of menopause, but these are due to hormonal imbalance. Alcohol and hot flashes are related, too! Hot flashes are believed to be caused by increased blood flow in the brain. Once it detects an increased body temperature, it prompts the release of chemicals to dilate blood vessels in the skin. Surplus heat will then be radiated into the surrounding air. Estrogen can apparently allow the body to have a greater tolerance for body temperature changes. Usually, the body can easily adapt to a change of 1.4 degrees Celsius before it dilates the blood vessels, but if there is a decrease in the hormone levels, dilatation will occur faster. The hot flash will stay as long as needed to release the surplus heat. Facial flushing due to drinking spirits can happen for two main reasons – enzyme deficiency or rosacea. In both cases, ethnicity plays a huge role. Most Asian populations are known to lack an enzyme called alcohol dehydrogenase. It’s the one responsible for breaking down alcohol. As discussed earlier, alcohol is toxic to cells, and when it reaches the blood vessels, it causes dilatation. This reddens the skin and explains why does alcohol warm you up. Without a sufficient amount of this enzyme, alcohol can reach toxic levels much earlier in the cells. Fair-skinned people from the Northern part of Europe may have some have signs of alcohol allergy or rosacea. This is a common skin condition marked by hyperactivity and vasomotor instability. Dilatation of skin blood vessels can be caused by several other things aside from alcohol. Other triggers would include chocolates, spicy foods, hot beverages, and more. Alcohol’s causative relationships with the above mentioned side effects can be short-term and may only happen if alcohol is present in the bloodstream. But with regular alcohol consumption, though, they can have different effects. For cases wherein one cannot stop drinking alcohol, long-term alcohol treatment centers can be of great help. They offer counseling programs and rehabilitation to help a drinker recover from alcohol addiction. Learn more about alcoholism treatment program features to find one that meets the needs of the individual.